If you’ve run into financial hardship that has made it impossible to pay your bills, you’re not alone. Because of this, there are options available to you to help get you back on your feet. Declaring bankruptcy is a legal action to give you a fresh start financially. Federal law gives us the right to file bankruptcy and, as such, all bankruptcy cases will be handled in Federal Court. When you file for bankruptcy, it stops creditors from attempting to collect debts from you immediately, until your debts have been sorted according to the law. Filing for bankruptcy can do many things for you. First and foremost is the discharge of debts, which eliminate your legal obligation to pay most or all of your debts. This is intended to provide you with that clean financial slate you need to get your head above water. Furthermore, bankruptcy can stop a foreclosure on your home to give you a chance to catch up on missed payments. It is important to note that bankruptcy will not eliminate mortgages or other liens on your property without any payment. Other things bankruptcy can do include preventing a repossession of personal property, halting wage garnishment and debt collection calls, and restoring or preventing termination of utility services. This is not to say that bankruptcy is a cure-all or something to be taken lightly. Bankruptcy cannot cure all financial problems and is not the right fit for every situation. For instance, bankruptcy can’t eliminate certain rights of “secured” creditors, who have taken a mortgage or other lien on a property as collateral for a loan. There are some types of debts that have been identified by bankruptcy law for special treatment, meaning child support, alimony, student loans, and criminal fines are not able to be discharged, just to name a few. Additionally, bankruptcy will not protect cosigners on a debt, instead leaving the cosigner to repay part or all of the debt after a bankruptcy has been filed. Chapter 7: “Straight” bankruptcy, also referred to as “liquidation”. Requires the debtor to relinquish property which exceeds limits known as “exemptions”. This property is then sold to pay creditors. Chapter 11: Commonly referred to as “reorganization”. Utilized mainly by businesses and some individual debtors whose debts are considerably large. Chapter 12: Reserved only for family farmers. Chapter 13: Most often called “debt adjustment”, this form of bankruptcy requires a debtor to file some sort of plan to pay debts, either in part or in full, from their current income. Most people filing for bankruptcy will either file under chapter 7 or chapter 13. Either form of bankruptcy can be filed individually or jointly by a married couple. 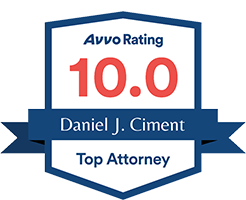 Daniel Ciment has assisted thousands of Texans to file for bankruptcy protection under both Chapters 7 and 13 of the Bankruptcy Code. Filing for bankruptcy in Texas is a complex process and if it’s not handled correctly could cost you severely. It’s always in your best interest to have an experienced bankruptcy attorney guide you through the process of filing for bankruptcy. Most Texans that file bankruptcy don’t lose any of their belongings. If you would like to learn if bankruptcy is right for you, call the Ciment Law Firm today for your free consultation. Remember, bankruptcy is not the end of your story. It’s a means to an end that may allow you to get the fresh start you need, and Daniel Ciment is here to help.